OSCARS Carrick Knowe Easter and summer camps are designed to provide nonstop activity and fun from the start to the end of the day. Children, who can attend from any school, participate in four, five or six activities daily each for between 60 and 90 minutes depending on the activity. Days tend to be theme led with activities revolving around the theme. Themes include 3D images, OSCARS morning TV, Kings & Queens, the seaside, Warriors in the Woods and others. Children can be divided into specific age groups following their own timetable which includes a diverse activity list, but also the groups may join together for specific controlled suitable large group activities. Children will never be bored – they’ll want to come back for more! Friendly, approachable staff who show a genuine interest in the kids’ welfare, and provide a clear line of communication with the school. With a mix of kids from different primary schools and varying ages, it’s lovely seeing them all play and talk together. My children always come away happy! The staff are popular with the children and can be relied on by parents. They are also flexible and happy to help with adhoc short notice requests for help. OSCARS @ Carrick Knowe Edinburgh is based at Carrick Knowe Primary School in Lampacre Road, Edinburgh EH12 and is easily accessible from the city centre. We have tried to make these web pages as comprehensive as possible. The following section may answer a few questions you may have. If there is anything else you would like to know please do call our office on 0131 557 7500 or e mail admin@oscarschildcare.com where a member of our team will be delighted to assist. OSCARS provides breakfast (cereals, toast and fruit juice) up until 8.30am, and a mid-morning and mid-afternoon snack break which varies from day to day but will always include fruit, non-fizzy juice and water. Please provide your child with a packed lunch. Parents should ensure lunch boxes contain a freeze block to comply with food hygiene guidelines. During the online registration process you will be asked to complete a confidential medical and consents form for each child attending. This is an important document. If booking by telephone you will be sent a copy of the form via e mail. This should be completed and returned to OSCARS at least one week prior to attendance. OSCARS employ a number of first aiders who are on site each day to tend to minor bumps and bruises. We recommend that children wear practical and comfortable clothing: e.g. shorts and t-shirts, jeans and sweatshirts depending on the weather. In hot weather a cap and sun cream can be useful. Theme days will take place each FRANTIC FAB FIZZING FRIDAY and these will be publicised at camp reception from each Monday. Formal activities commence at 9.25am and finish at 5.00pm but children can arrive from 8.00am and stay until 5.45pm. For children arriving between 8am and 8.30am OSCARS will provide a breakfast of cereal and toast followed by supervised passive activities such as board games and films. In the late afternoon from 5.00 – 5.45pm children waiting for collection will participate in the same passive activities. OSCARS recommends that you do not bring valuable items to our programmes such as iPads or computer games or expensive phones – for a start there will not be time to use them. Staff cannot be responsible for such items and OSCARS will accept no liability for loss or damage. All lost property is kept for one month after the end of each holiday programme and then if not reclaimed is donated to charity. OSCARS pays a great deal of attention to security at our centres. Anyone visiting our sites receives a visitor badge from the management team on being admitted. 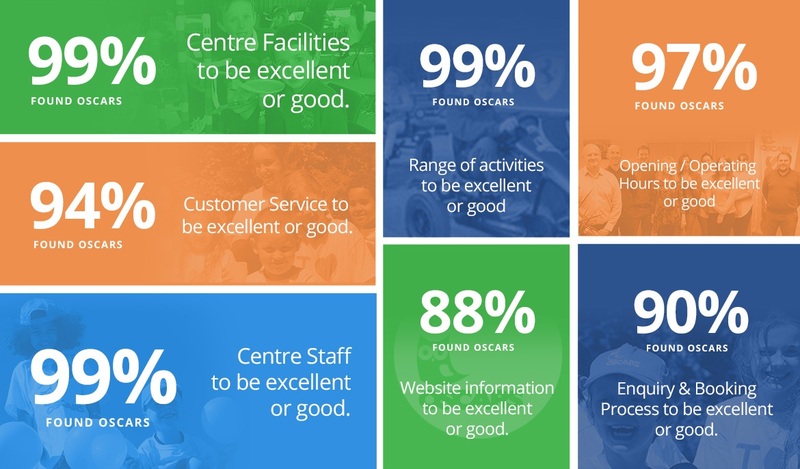 Each centre has clearly defined boundaries and all staff wear OSCARS t shirts and an ID lanyard making them easily identifiable. All children have to be signed in and out by a parent or guardian who is listed on the initial registration form. Children can sign themselves in and out only if OSCARS receives a signed letter of authorisation from a parent. All staff go through a rigorous recruitment process including full Disclosure check via the PVG (Protection of Vulnerable Groups) membership scheme and no member of staff works with children in our care until they are cleared to do so by the relevant authorities. Nothing matters more to us than the safety and well being of all children in our care. Everyone receives a free OSCARS t shirt on their first day of attending, plus a further gift at the end of the week. OSCARS understands that particularly young children can tire as the day goes on. Therefore regular breaks are built into the schedule and active sessions are intermingled with passive sessions. Each centre has a quiet corner where children can retreat to if necessary and whilst time spent at OSCARS is highly active there is always a space to have fun more quietly. OSCARS staff are experienced in enabling children to relax, feel at ease and join in. Group activities take place at the start of each day so that children mix and communicate and socialise from the moment activities commence. A lot of children claim not to enjoy sport but all children love running around, playing games and participating in activities such as art, clay modelling, dance and drama. The priority at an OSCARS multi activity camp is to have fun and join in and our staff are specialists at encouraging children to do exactly this. OSCARS caps the numbers who can attend each of our centres on a daily basis, and we do become full during specific weeks. Early booking is recommended. However, we completely understand that schedules can change so we can accept late bookings depending on availability. Simply phone our registrations team at Head Office on 0131 557 7500 to check availability. OSCARS is registered with a wide range of voucher companies and they can be used for full or part payment for almost all of our holiday programmes. OSCARS can also take payment via your tax free childcare account. Simply call head office on 0131 557 7500 or e mail admin@oscarschildcare.com for the relevant number for the voucher scheme your employer utilises. Many children enjoy attending OSCARS for a number of weeks in their holidays. Due to the large range of activities, and different theme days no week is the same. There is always variety and something new to try. 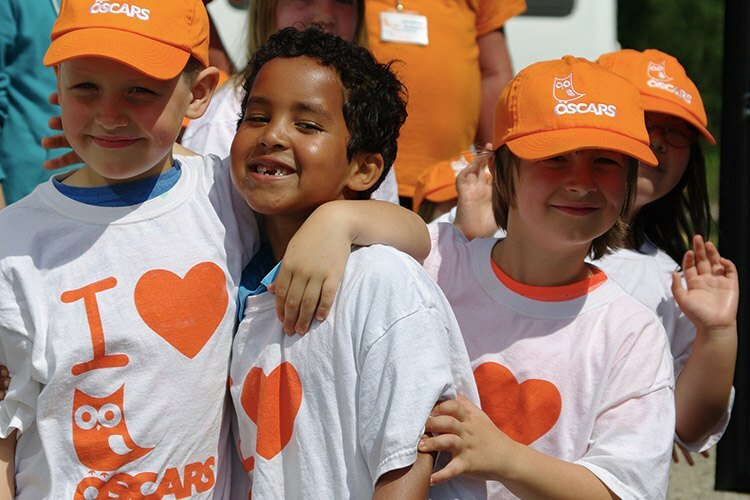 OSCARS welcomes children from throughout the world who are on holiday near to our centres. Our centres provide great opportunities for foreign children to mix with British children and communicate in English whilst participating in a fun filled day. Everybody who attends OSCARS receives at least one OSCARS certificate in recognition of their progress throughout their time with us. This is presented by our groovy mascot – OSCAR – on a Friday afternoon to weekly leavers. Flexibility is our priority when you register for an OSCARS programme as children can attend for full weeks, part weeks, full days or half days. You make the booking to suit your requirements. OSCARS prices for Easter and summer 2019 are as follows. They include extended opening times, all activities and excursions and snacks. Families booking more than one child receive a 5% discount on their final invoice price, excluding excursions. Book and pay a deposit by (and including) 08 March 2019 and receive a 10% discount on your final invoice price, excluding excursions. Complete the online booking form 24 hours per day. You will receive an initial e-mail confirmation of the registration by return and a member of the registrations team will be in touch to take your card payment during the next working day. Registrations can be made by telephoning 0131 557 7500 during office reservation hours – Monday to Friday 9.15am – 5.30pm. The deposit or full payment may be made using credit/debit cards. CHEQUES can be sent to OSCARS head office to be received within 5 working days. Please make cheques payable to OUT OF SCHOOL SCOTLAND LTD and write your child’s name and account reference if known on the back. OSCARS is not responsible for any bank charges incurred. All payments should clearly state your OSCARS account reference as indicated on your invoice, to ensure correct allocation of payment. A Deposit of £40 per child is payable at the time of booking, which is non-refundable. EASTER CAMP balances are due on Monday 4 March 2019. SUMMER CAMP balances are due on Monday 27 May 2019. If registering for Easter dates after 4 March full payment is due immediately. If registering for summer dates after 27 May full payment is due immediately. All bookings must be paid in full prior to your child’s first day at camp.